Tom Sawyer Country Coffee is tucked away, but well worth finding. The scent of fresh espresso permeates the air, and a charismatic barista mans the counter to take your order. Hip-looking college kids sit at some tables, basking in the soft glows of their laptop screens as they sip on their tasty beverages. The place is sleek and clean, dusted to perfection, but also decorated tastefully and distinctively. The above imagery describes just about every good coffee shop in existence, and can likely be applied to your preferred espresso destination. When you're on the hunt for your morning (or afternoon, or evening) joe, sometimes your favorite cafe fits the bill. But other times, you want to venture somewhere new, somewhere besides the established local greats — the Rockwood Bakeries and Atticuses of the world. When that urge strikes, you don't want to be left helpless to frantically Google an appealing option, or resort to one of your safe bets. Instead, prepare for the situation beforehand by educating yourself on the below trio of great, lesser-known espresso joints in the Spokane area. Nestled just west of the Kendall Yards commercial strip on a corner you might never find unless you're looking for it, Tom Sawyer qualifies as a true hidden gem. 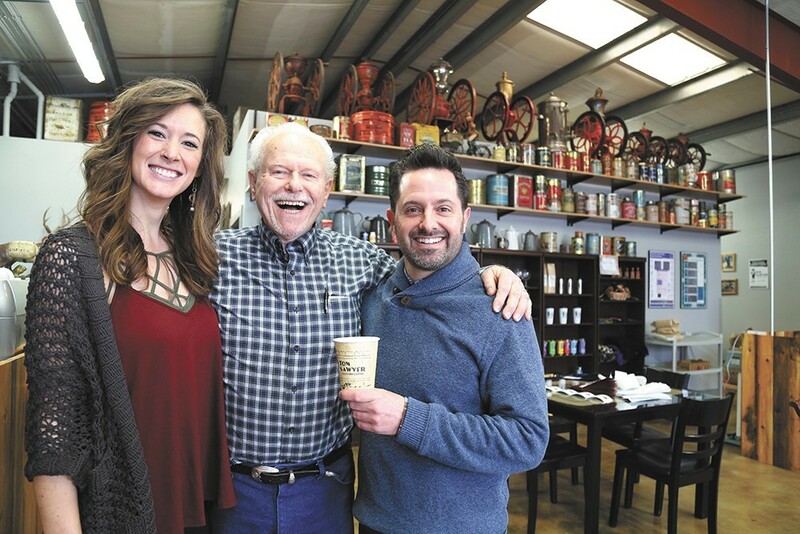 Its owner, 73-year-old Gary Tom Sawyer, has been roasting coffee for the better part of 55 years, but the doors to his Spokane shop just opened last October. A gaping garage door opens when the weather allows for it, while the company's large, red metal roasting equipment gives the inside an almost industrial feel. Old coffee cans, containers, and french presses adorn the shelves on the walls, contributing to a vintage vibe, and several glass-covered tables give the room a communal feel. It's usually quiet in the shop, but comfortably so, with customers sounding the door's chime as they enter and exit from time to time. The menu isn't overly ambitious, but the flavors are top-notch, and the baristas are willing to lend suggestions. It isn't uncommon to hear them asking their customers' names; the place seems intent on building the kinds of relationships that make for an enduring, beloved business. If you're in the mood for a refreshing treat, try an iced latte with Tom's signature toddy shots. You won't regret it. Indaba already has a successful location north of downtown near the Spokane County Courthouse, but it recently opened a second shop in the heart of the city, just down the block from the well-known Atticus Coffee & Gifts. Indaba's sleek interior, with art adorning the walls and white countertops showing off its state-of-the-art equipment, is simple and tasteful, aimed at those wanting a quiet place to escape the hustle and bustle of downtown. Prepare to pay a bit more for your beverage, but know the quality offsets the price — Indaba gets creative with alluring menu items like its Lemon Vanilla Latte ($5, and dangerously delicious with fresh-grated lemon peel) and its Nitro Float, topped off with two scoops of vanilla ice cream ($8). If you're looking for something simple and refreshing in the summer heat, the sharp, flavorful Nitro Cold Brew, brewed with nitrogen, has your back ($4). Or try something classic — lots of care goes into this coffee, and it shows. A drive-thru espresso stand on the fringes of downtown near the I-90 entrance might not strike you as a must-visit place, but the unassuming Harmony disproves doubters on the strength of its creative Signature Drinks menu. Its workers are eager to point new customers in the direction of the concoction best suited to their current needs, whether it be a refreshing cool-down or a comforting wave of warmth. That's fortunate, because reading the menu makes just about everything sounds delectable — choosing without help could be difficult. There's the memorably-named Tigers Blood, a mixture of cayenne pepper, macadamia nut, and chocolate; the Golden Dragonfly, whose caramel and brown sugar cinnamon make for a perfect iced treat; the Viola Watson, a blackberry and salted caramel mix that's mouth-watering when taken hot; and a few more. Harmony's Signature Drinks are desserty, but intentionally crafted and not overwhelmingly sweet. Don't judge this book by its cover.